Howard Mudd: O-Line Genius or Overrated? Last year, I questioned Bobby April’s track record as a genius special teams coach. His results were not quite as stellar, nor his turnarounds as quick as many people seemed to suggest at the time. This offseason we have new darling, genius, best-in-the-NFL assistant coaches in Philadelphia. Most notable is offensive line coach Howard Mudd, whom Andy Reid was delighted to lure out of retirement. Certainly he’s had a lot of success. 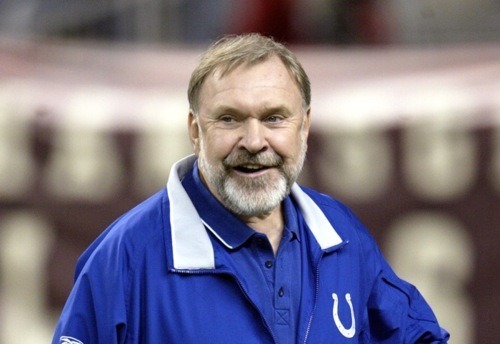 Mudd’s tenure in Indianapolis from 1998 to 2009 was simply brilliant. In fact, if you’d gone through Football Outsiders offensive line rankings (I have), you would think there’s been a mistake. The Colts were either first or second in the NFL for Adjusted Sack Rate in ten of the twelve years he was their coach. And the only two years in which the Colts weren’t that high, their offensive line was still ranked in the top ten. Mudd must be doing something right in order to orchestrate such great protection. Unless… it wasn’t actually the offensive line. Unless it was the quarterback. See, it just so happens that Mudd’s first year in Indianapolis corresponded with Peyton Manning’s arrival. And guess what? After Mudd retired following the 2009 season, the Manning-led Colts didn’t skip a beat. In 2010 they were ranked number one yet again in Adjusted Sack Rate. Furthermore, while the Football Outsider numbers don’t cover years before 1996, we can still look at basic sack rates at Mudd’s previous job. From 1993 to 1997, Mudd was the offensive line coach for the Seattle Seahawks. Only in his final year did the team allow fewer sacks than the NFL average. None of this is conclusive evidence that Mudd isn’t a great coach. But it does bring into question the evidence for Mudd’s ability to single-handedly mold the Eagles offensive line into a great unit. I hope he can upgrade the Eagles offensive line, but that’s a hope — certainly no guarantee. Tagged with Philadelphia Eagles, NFL, Howard Mudd, Offensive Line, Sacks, Adjusted Sack Rate, Peyton Manning, Indianapolis Colts. July 20, 2011 by Brian Solomon.